Coal vs. fossil fuels and renewable energy: Why the dirty fossil keeps losing ground. And its enemies are multiplying. 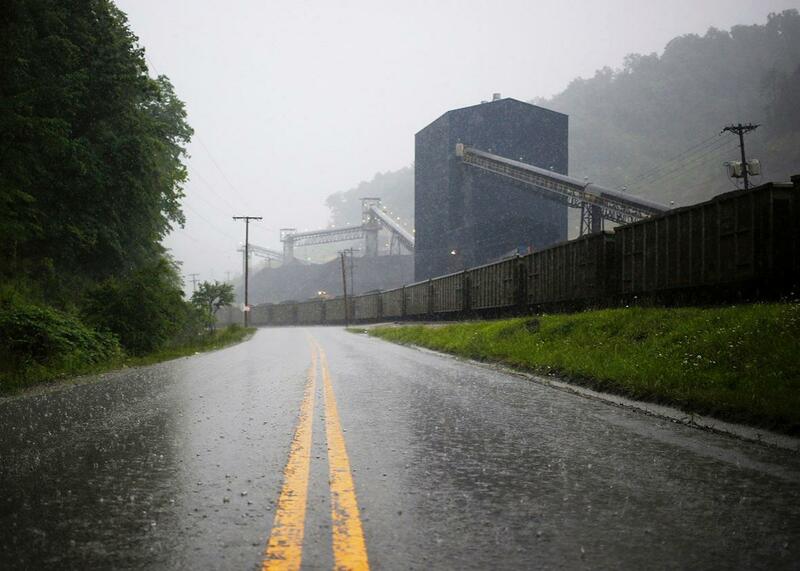 A road leads past a coal train sitting alongside the Blackhawk Mining, LLC Spurlock Prep Plant on June 3, 2014 in Printer, Kentucky. There is, indeed, a war on coal going on. But while politicians and industry lobbyists tend to identify the Environmental Protection Agency and the Obama administration as coal’s chief antagonists, the array of forces facing the powerful black fuel is far greater. Yes, the government is insisting on stricter pollution control standards from coal power plants. But coal’s enemies also include the vast natural gas industry, rising renewable energy technologies, decreased global demand, Wall Street, and deep-pocketed nonprofits that deem coal a public health threat. And this week they notched a host of victories that show the war is becoming a rout. The main foe coal faces is cheap natural gas. Along with renewables (which are getting cheaper and offer the prospect of emissions-free power), natural gas has captured significant territory that once belonged to the legions of coal. This is a problem for coal producers, since U.S. power plants are the main source of demand for coal. (The U.S. exports about 10 percent of coal production. But with China’s industrial engine slowing, exports are also plummeting: They were down 20 percent in the first quarter of 2015 from 2014.) And that’s leading to a significant decline in coal mining. EIA data shows U.S. production of coal in the first five months of 2015 was off more than 7 percent from the first five months of 2014. In May, production was down 16.6 percent from May 2014. Simply put, the U.S. energy industry has stopped building coal-fired plants, and is adding plants that don’t use coal. So far this year, according to the Federal Energy Regulatory Commission’s April infrastructure report, no new coal capacity has been added, while natural gas (1.5 gigawatts), solar (937 megawatts), and wind (633 megawatts) have each added a decent amount of production capacity. Of the nation’s installed electricity-producing capacity, coal only accounts for 27.5 percent, compared with 42.2 percent for natural gas. Sharp declines in sales, and low prices, make it difficult for companies to stay in business—especially heavily indebted companies. Walter Energy, which was the 14th-largest U.S. coal producer in 2013, announced Wednesday that it was filing for bankruptcy protection. The company had bulked up in 2011 in anticipation of rising demand and robust prices due to heavy coal use in the U.S. and in China. When it lost both those bets, its $3 billion in debt become unsustainable. Walter isn’t going to close all its mines, or stop producing coal. But it will likely shrink its operations and have a difficult time getting funds to expand operations in the future. Wall Street has soured on coal producers like Walter in part because today’s results look bad, but largely because tomorrow’s results look even worse. The stock market is famously a futures market—investors are making bets based on future cash flows they expect companies to produce. It’s difficult to see a positive future when the main coal customers are literally dismantling the machines that burn coal. Yes, the U.S. will burn coal—and lots of it—for many decades to come. And yes, the election of a Republican president in 2016 might reduce some of the regulatory pressures on coal. But the utility industry—the chief customer for coal—moves slowly. Power companies plan for the long term, since it takes a long time to build power plants and transmission lines. The decisions they make today may not actually come into effect for five to eight years. And here, too, we’re seeing that, as a result of pressure from several sources—government, cheap natural gas, campaigns like the Sierra Club’s Beyond Coal initiative, which Michael Bloomberg’s nonprofit is backing to the tune of $80 million—companies are making important decisions about future coal use. The challenges to coal go far beyond zealous regulators and a temporary slowdown in demand from China. Many of its biggest customers are announcing plans to boycott the product, to turn to substitutes, and to mothball and scrap the giant machines that have used it for generations. . It’s hard to think of another basic industry of comparable size in which future demand has dissipated so rapidly. But barring sharp breaks in existing trends, an increasing amount of coal will be left in the ground.